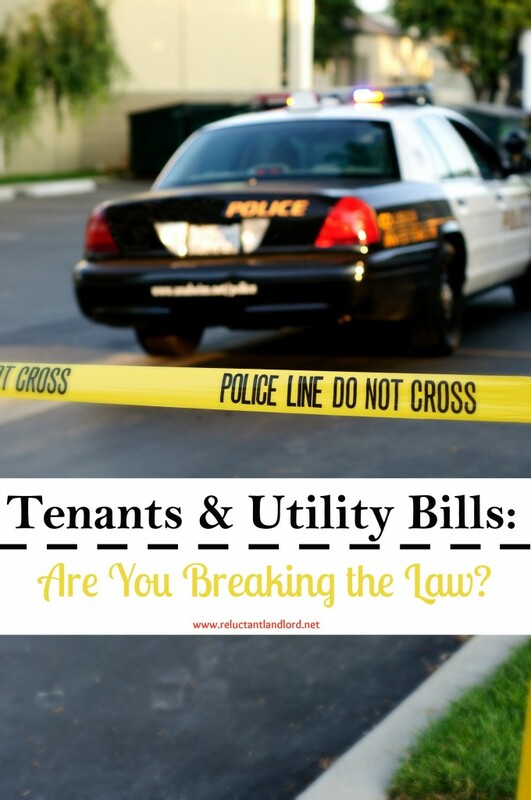 Tenants and Utility Bills: Are you Breaking the Law? You are here: Home / I am a Reluctant Landlord / Tenants and Utility Bills: Are you Breaking the Law? Tenant move-in utilities are still in your name, so you just turn the utilities off, right? NOOOO!!! You have just broken the law. Legally, you are not allowed to turn off the utilities on your tenants. You can be fined and even sent to jail, even if it does say in the lease that the utility bills are the responsibility of the tenant. So as a Landlord, what are your options? Here’s what you can do! 1. Bill Them Back. You can charge them for the utilities. In my lease it says all bills are paid first and rent is paid second so that is why I would charge the utility bills first. This way the non-paid money becomes rent, which means a late fee will be due. If they do not pay, you can do a three day quid-pro on the balance. The old apartment company that I worked for would start the eviction process on anyone who had more than a $500 balance. 2. Don’t Put the Utilities on. Personally, I don’t switch the utilities into my name. This way there is nothing to turn off and it forces the tenant to turn on the utilities as soon as they move in! 1. Switch Utilities Off. Once the tenant takes possession of the house you are not allowed to remove the utility service. This includes giving the utility company notice and having them contact the tenant. If it goes to court, you will lose. A good friend of mine is an amazing realtor. When we bought our house she sent me an awesome utility list. Since then, I have used it over and over for all my tenants. I find that if I make it easy for them to get the utilities turned into their name it is very effective. Remember: making it easy = less stress for you!